A backyard redesign allows you the opportunity to create a beautiful outdoor living space in Greenville, SC . If you have a backyard pool, you can create a lush oasis that will allow you to relax and enjoy your swimming pool with family and guests. Keep reading for some great design elements to consider for your backyard redesign. A backyard pool installation will make your home feel like a relaxing retreat. These days, pool installation from a reputable swimming pool company is more affordable than ever. Rather than spending money on costly weekend vacations, you can enjoy your own private in-ground pool. Swimming pool contractors with experience in pool design and backyard redesign can even help you design a custom pool, like a luxurious salt water pool. Your swimming pool will become the focal point of your backyard redesign, serving as a gathering place for friends and family. Whether you decide to install a swimming pool or not, an elegant patio space is the perfect place to entertain. Install a concrete patio or wooden deck in your backyard, and you can host backyard cocktail parties or barbeques. A spacious backyard patio is the perfect outdoor living space, as you can decorate with comfortable patio furniture, lounge chairs, festive patio lighting, and patio heaters and fans, which will keep you and your guests comfortable year-round. Fireplaces, hearths, and water features are the most popular trends in backyard redesigns that center around outdoor living spaces and custom swimming pools. A fireplace allows you to enjoy your outdoor living space, even in the chilly night air. It’s also the perfect place to socialize, as it creates an elegant ambience. Hearths allow you to cook delicious meals when you entertain, and they also provide a beautiful centerpiece for any outdoor living space. Water features, such as fountains and waterfalls, can transform your backyard pool into a relaxing, comforting spa. Outdoor living spaces near Greenville, SC are excellent home additions because when you create them properly, you can enjoy them all year long. These living spaces can serve as a hangout between the house and your backyard pool or a place to dine under the stars with your friends. Successful outdoor living spaces tend to feature a few similar elements that allow them to thrive. Here is a look at some of the top trends in outdoor living spaces. 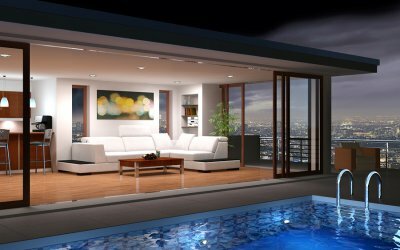 There are few better ways to spend a summer night than relaxing by the pool, and every homeowner who wants an outdoor living space should take this into consideration. Remember that your pool is not just a tub of water that helps you cool down and beat the heat; it is also a focal point that draws the eye. Some people enjoy the relaxation they feel while staring at the water more than they enjoy actually going swimming. Make it easy for you to see your pool from your outdoor living space. This can unify the two elements of your yard and contribute to a stellar and cohesive design. Your outdoor living space should not only feel seamless alongside your pool, but it should also give the sense that it is an extension of your indoor living space. Borrow floral elements from your interior design when outfitting your outdoor living space. Since every kind of living space must have seating, consider incorporating designs or fabrics from your indoor furniture into your outdoor seating. It is also a good idea to bolster your outdoor living space with some sort of shelter such as an awning, an umbrella, or even an extension of the roof of your house for a holistic atmosphere. As a central hub between your home and your pool, your outdoor living space should be easy to access. Consider including a tall sliding door that leads from your kitchen to your outdoor living space; this setup is especially convenient if you plan on preparing a meal indoors and serving it outside. The experts at Gerhart Pools have spent more than 30 years bringing custom pool and backyard dreams to life. Let us help bring your custom backyard to life. Please leave a review about your experience with us on our Google+ page. We look forward to hearing from you. Why should your lifestyle be confined by your home’s walls? Outdoor living spaces increase the value of your home and give you a chance to take full advantage of your yard. 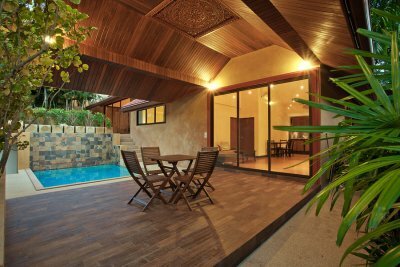 To create a great outdoor living space, start with a remarkable focal point, like a custom pool. With a custom pool, your swimming pool contractor will work with you to choose the right layout, size, and materials for your new pool. You can even add custom water features, opt for a saltwater pool, or incorporate other personalized elements to make your outdoor space really feel like home. Learn more about creating an outdoor living area in this infographic from Gerhart Pools . Our swimming pool company in Greenville has been nationally recognized for our craftsmanship and design and will work with you every step of the way as you create your new outdoor living space. Help inspire your fellow homeowners to live life a little bit more outdoors by sharing this information. People have always used natural features like plants and rocks to bring the outdoors in, but why not bring the comforts of inside out? A relaxing outdoor living space can provide an oasis for your friends and family to enjoy the great outdoors in supreme comfort. If you’re thinking about adding an in-ground swimming pool, now is also the perfect time to redesign your backyard and create the outdoor living space you’ve always dreamed of, or never knew you wanted until now. Either way, here are some tips for a total backyard redesign in Greenville . Whether you enclose a gazebo or have an entirely new space built from scratch, you want to be sure to protect your outdoor room from the elements. An eye-catching awning will add pop to your outdoor room while also allowing friends and family to entertain themselves outside even during inclement weather. You should also only use fabrics and furniture designed for use outdoors so as not to ruin your favorite belongings. When designing your outdoor living space, think of all the creature comforts you enjoy indoors that you wish you could enjoy outside. For example, an outdoor kitchen can help you whip up tasty meals for your loved ones while keeping an eye on the kids in the swimming pool. You can also mount a flat-screen television to watch your favorite programs or catch your favorite sports team while cooling off in the pool. Speaking of the pool, you should design your outdoor living space in such a way that the focal point of your redesigned backyard is the beautiful new swimming pool you just had built. If you took the time to find the right swimming pool contractor in Greenville, show off your beautiful investment by making the pool the focal point of your outdoor oasis.